I love the fresh, crisp look of white jeans for the summer. Like all of the other colours of jeans you already own, white denim is super versatile. On top of that, they speak the language of summer: laid-back, simple, fresh, pretty, and bright. They make me think of iced cocktails enjoyed on a patio, breezy walks along the beach and sitting on a park bench in the dappled shade. Sounds like they would make good pants for a date night, don’t you think? Your instant reaction to this pale version of denim may be to shrink back in laundry panic but this isn’t necessary. I have had my white denim straight legs since 2012 and they wash up perfectly tossed in the machine with my lights load. And I have a toddler. Now that we have conquered the cleanliness issue, let’s talk about types of white denim. There are many versions of the white jean and all iterations hint at stylishness. I think they are summer-perfect as an ankle-length skinny jean. Wide-leg white denim makes a bold statement no matter what you pair with it. 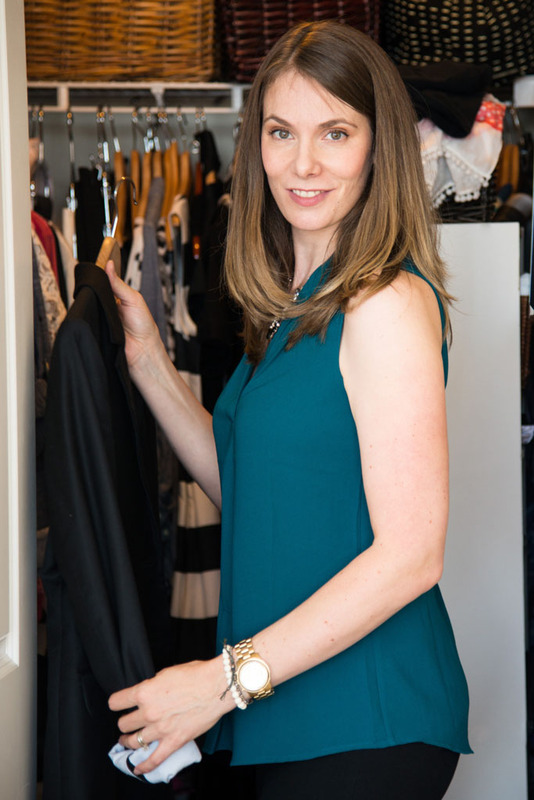 Cropped wide-legs are fashion-forward and can easily be dressed up or down in warmer weather. My straight leg version can be rolled up or left full length. Even relaxed boyfriend style jeans are just right for the summer season. How to style white jeans? Put them on with anything! They really do brighten up any outfit you try. Here are a few ways to make them look just right. The easiest way to try out denim-on-denim styling is to pair any denim top with your white jeans…a chambray shirt, a denim button-up, a jean jacket, a denim tunic, a chambray dress. This really is an endless list. 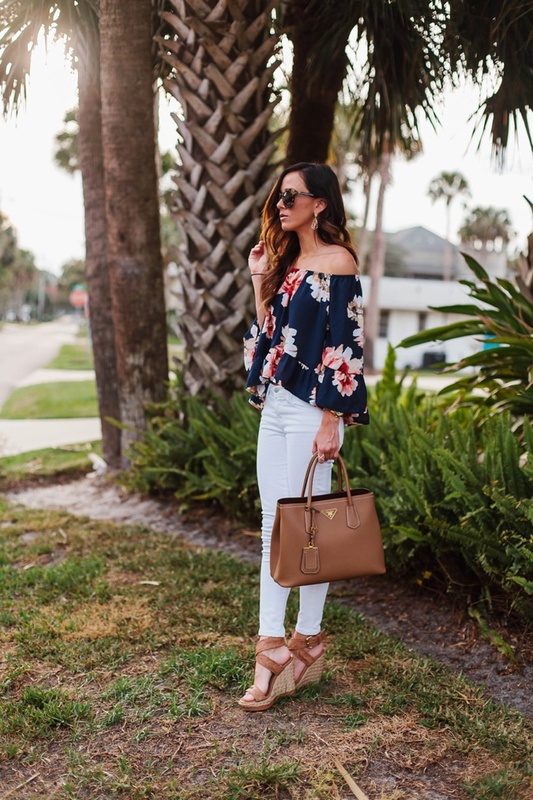 Pairing white jeans that, by the very nature of jeans, cover of your bottom half together with a top that shows a little of your skin is a match made for summer. Wearing a light coloured top and bottom is lengthening. 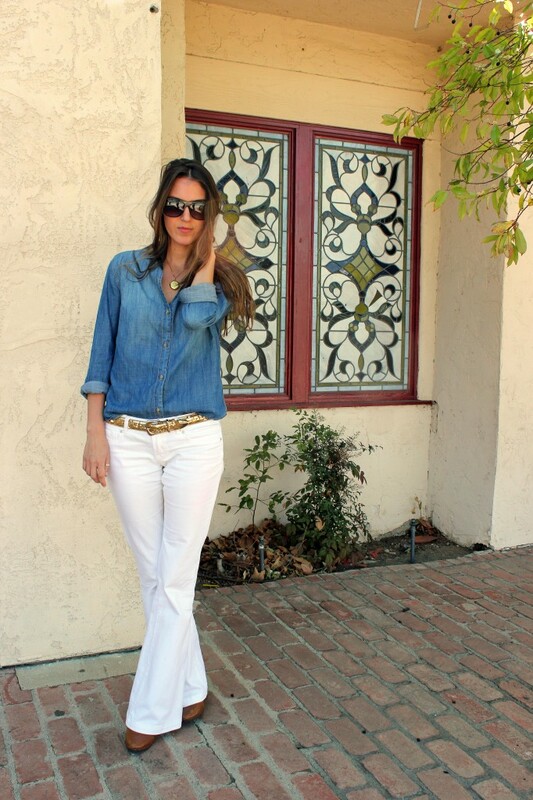 White jeans make it easy to do it in a casual way. Whites, taupes, creams and soft pinks will all fall in to this category. 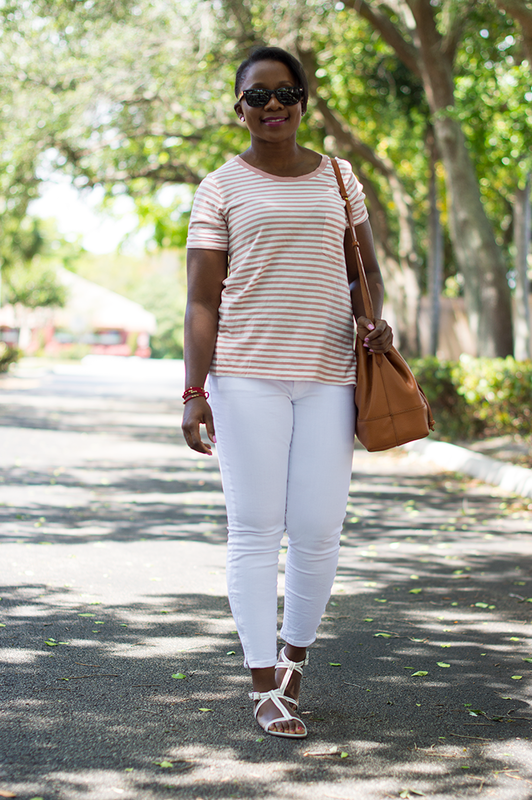 White Jeans and Stripes – Nautical! White-based striped tops are an ideal mate for white bottoms. The combination is a nod to nautical without being too literal. Almost any striped top you own will pair well with any style of white jeans. To speak to the year-round versatility of white denim, here are some examples of cold-weather outfits featuring them. While white jeans speak to summer’s laid-back ease, they certainly bring style to your cold-weather wardrobe as well. Here are just a few examples to further convince you of their versatility…for next season. Try out a pair of white jeans in the next few months. You might be surprised at how many times reach for them this summer and then through all seasons! For more styling tips and behind the scenes peeks follow us on Instagram. I love a pair of white jeans!! Definitely time to pull them out of the closet again…thanks for the reminder!